Remembrance of the Dead is an official memorial day in the Netherlands held annually on May 4. 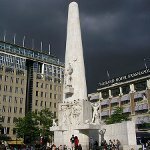 It commemorates all those who have died in wars or peacekeeping operations since the involvement of the Netherlands in the Second World War. Such a date was chosen because the next day the Dutch celebrate Liberation Day that marks the end of the Nazi occupation. The day of celebration is preceded by the day of mourning for the fallen. Originally the remembrance day only honored those who died during WWII. Since 1961, the victims of other military conflicts and peacekeeping missions involving the armed forces of the Kingdom of the Netherlands have also been remembered. Civilians who have died in wars are remembered as well. The main ceremony takes place at the National Monument on Dam Square in the capital of Amsterdam. It is typically attended by the members of the royal family, government officials and military leaders. The ceremony is broadcast by the Dutch Broadcast Foundation (NOS). At 8 p.m., two minutes of silence are observed throughout the country. From 6 p.m., all national flags are flown at half-mast. After the remembrance ceremony, they are hoisted to the music of the Dutch national anthem. Since 2011, it is allowed to let them fly at half-mast.